After honing in on its Mr. 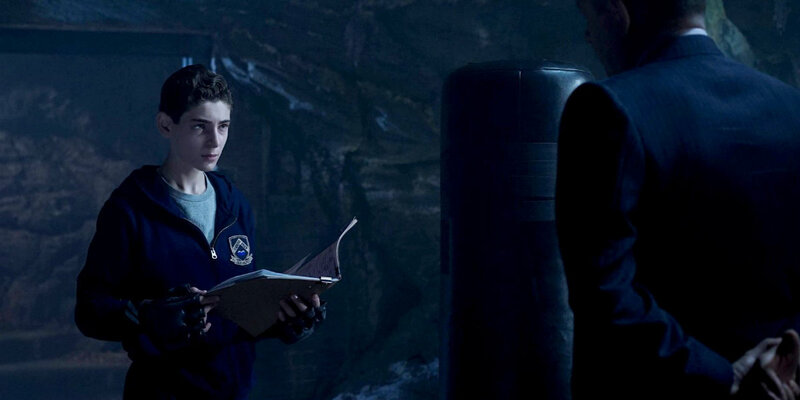 Freeze origin story in the last two episodes, Gotham finally turns its attention to young Bruce Wayne's (David Mazouz) encounter with the man who he believes killed his parents. Meanwhile, Penguin's (Robin Lord Taylor) story gets even stranger as his therapy continues at Arkham, and Nygma (Cory Michael Smith) draws ever closer to his destiny as one of Gotham's most notorious super-villains. Let's discuss this week's new episode, "This Ball of Mud and Meanness". Early on, Selina (Camren Bicondova) hands Bruce the gun he asked for, and the show hints at the future Batman's eventual disdain for the weapon. This is good character-based drama that Gotham delves into here, as it explores the evolution of young Bruce into the Dark Knight. When he and Alfred (Sean Pertwee) go searching for Matches Malone (Michael Bowen), the butler takes the opportunity to school Bruce in combat. Although Alfred's fight with the ironically named "Cupcake" (Jamar Greene) felt shoe-horned into the episode to add a bit of action, the sequence did at least include name-checks for DC villain Solomon Grundy and the Mutants: the Gotham street gang most famous for their role in Frank Miller's The Dark Knight Returns. Ultimately, Bruce slips away, of course, and goes to track down Matches on his own. Lori Petty brought some life to her scenes as Jeri, the lead singer of a band that is heavily inspired by Jerome's reign of terror. Gotham hasn't exactly been subtle in keeping that character top-of-mind for fans, but given the role his legacy will likely play in the future -- and the reanimation plot that will rise to the forefront by season's end -- the hat-tip to the fan-favorite trouble-maker is a welcome one. Side note: who else thought Gordon's interrogation of Jeri, to which she asks the time, was a blatant shout-out to a similar moment with Gordon and the Joker in The Dark Knight? Once Jeri shares Matches' address, Bruce evades Gordon (Ben McKenzie) at the club and visits Matches' apartment, setting the stage for the episode's most pivotal scene. This is Bruce's one opportunity to seek revenge for his parents' deaths, and while fans no doubt were unsurprised that he didn't pull the trigger, the performances by both Mazouz and Bowen really sell the tension. The fact that Malone doesn't even remember the Waynes initially is perfect and goes to show just how little impact that night had in the life of a contract killer, despite the fact that it changed Bruce's world forever. With Bruce now formally beginning his exploration of the criminal underworld and vowing to "one day do something to help the people of Gotham," here's hoping the series continues to show viewers how the boy becomes the hero his city deserves. Carol Kane makes a surprise reappearance as Penguin's mother in the opening scene this week, with Penguin's remorse leading him to imagine him murdering his own mother. Naturally, all of this is simply part of Hugo Strange's (B.D. Wong) plan to rehabilitate the former king of Gotham. It remains to be seen exactly to what end Strange is "curing" Penguin of his violent tendencies, but it is a pretty sly connection that the formula he's using to torture him is based on that of Dr. Crane (whom the show hasn't touched on since mid-last season). As usual, the scenes within Arkham seem off. They are supposed to demonstrate the instability of the inmates there and presumably deliver an unsettling portrait of life among the criminally insane, but instead moments like the "ice cream test" scene instead just feel silly. Regardless, Penguin -- having decided to free instead of slaughter the inmate who earlier assaulted him -- is free to go, having been declared sane. Perhaps Strange is hoping to control Penguin and use him to manipulate the city of Gotham in some way. Only time will tell, but don't be surprised if Gotham leads Penguin into politics at some point, as his comic book counterpart has. For a while, Nygma is been treading a dangerous, bloody path towards his green-suited alter-ego, and now that Gordon is finally looking into Kristen's death (seriously, how long has it been since she disappeared? ), his ability to hide in plain sight is clearly diminishing fast. Smith has always had a firm grasp on the character, but this episode really plays up his paranoid nature more than ever before. While Gordon has been busy attempting to stop Bruce from committing murder, Nygma is convinced that Gordon is playing games with him and trying to outsmart him. It's an interesting development that plays into Nygma's arrogance, intellect and pride in being the smartest man in Gotham. The episode even ends with Nygma drawing a green question mark around a newspaper photo of Gordon. At last, it seems that the Riddler has found the final straw that may lead him to toss away his fake public persona once and for all and embrace his darker side. What did you think of "This Ball of Mud and Meanness"? Share your thoughts on the episode in the comments section below. Gotham returns with "Mad Grey Dawn" next Monday at 8pm on FOX.